Happy Monday!! I hope everyone had a great weekend!! It was a cold one here- we spent most of it under an extreme cold warning. I did some cleaning and organizing, a lot of Netflix watching, and spent time with a good friend. It can be so easy to get caught up in the negative of what's going on in the world and/or in your personal life. When there is negative happening, it's easy to focus on it and sometimes even let it consume you, forgetting the good that is also happening. 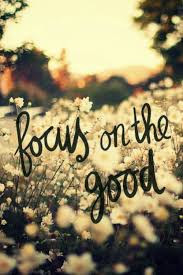 Challenge yourself to focus on the good- no matter how small.